Word on the street is that corduroy is trending this season, and I’m pretty excited about it. Cords are a great alternative to jeans for those of us who live a casual lifestyle, and the corduroy of 2018 is not the rigid fabric of the 1970s. The cords that are out now are extremely comfortable and figure flattering. Corduroy, that staple of 70s fashion, is making a serious comeback! And why not? The signature velvety texture and vertical ridges (called “wales”) have always been eye-catching, but now, with textures ranging from subtle to bold, and beautiful new designs including patterns and prints, corduroy is more versatile then ever. Like any fabric, however, corduroy has some quirks that can make it a challenge for those just discovering it. Check out these tips and tricks for working with corduroy! DON’T PRESS — If you’ve ever accidentally ironed velvet, you know exactly why you shouldn’t press corduroy. Pressing crushes the wales and leaves a shiny, flattened texture that’s unfortunately permanent. Instead of pressing your seams open as usual, finger-press the seams first, and then, using just the very tip of your iron, gently set the stitches by passing the iron down the seam. USE A WALKING FOOT– Because the texture of corduroy is very different from one side to the other, it’s quite easy for the fabric to “creep” as it’s being sewn. This means that the bottom layer is pulled along by the feed dogs, while the top has a tendency to lag behind, making your seams out of place and uneven. One way to help with this issue is to raise your presser foot slightly, provided your sewing machine allows for this kind of adjustment. An even better solution, however, is to use a walking foot, which provides the same kind of feeding motion to the top layer of fabric as the bottom and creating an even feed. 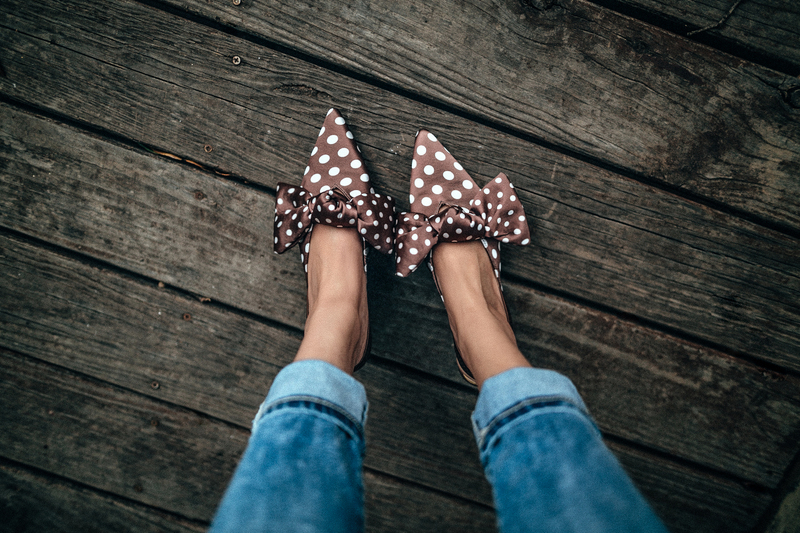 In fact, walking foot attachments are also sometimes called “even feed” feet! CHOOSE QUALITY FABRIC– Whenever possible, opt for an all-cotton corduroy rather than a polyester blend. The blended fibers don’t tend to hold up well in repeated washings, and the pile (that’s the fuzzy bits) is more easily crushed and misshapen. Cotton also steams evenly and takes well to finger-pressing, which is an important feature since typical pressing methods would damage corduroy. If you’re not sure whether the fabric you’re looking at is high quality, try scratching at its surface with a fingernail. If this causes discoloration or raises a powdery substance to the fabric’s surface, you’re likely looking at an inferior product that’s been filled with sizing to try to disguise the fact. 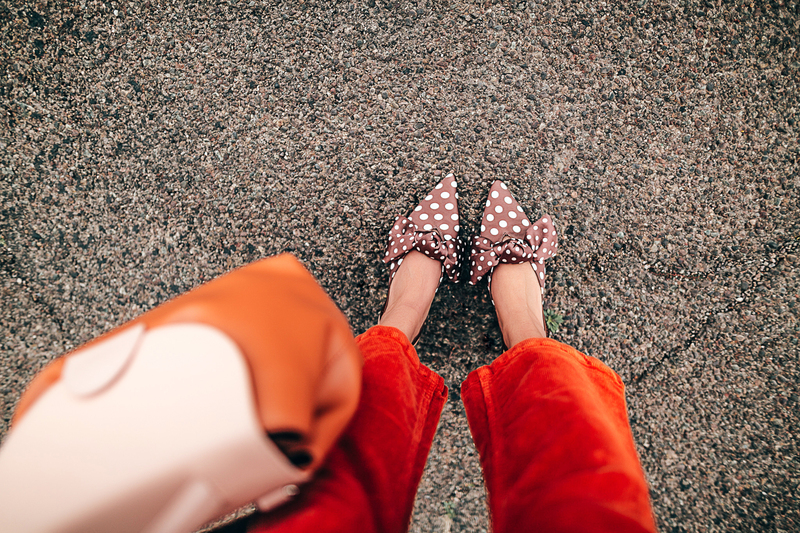 To finish off the look, I went with bright brown Who What Wear Top and polka dot bow heels and a light brown bag — one of my favorite fall combos — and I accessorized with a pink earring. This outfit is super simple, but I like how the coral cords are a little unexpected and the fur coat from Ivanka trump keeps it classy. Thanks so much for stopping by. Have a great week y’all! Next Post Rounding up your favorites in this week’s Instagram Roundup! Not sure if I seen anyone rock corduroy the way to do!! I seriously need a pair of myself now. Especially those red ones you are wearing here! So so cute. This trend is one for the books. I’m so glad it’s back! You look amazing Len! You look lovely in this outfit! It’s not easy pulling corduroy off though. Perfectly composed articles, thank you for the information. Keep writing baby!